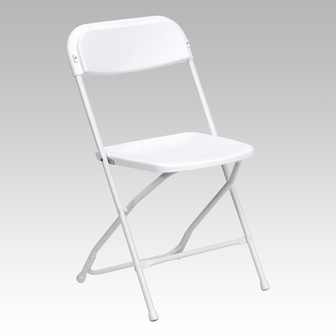 Our plastic folding chairs are commercial-grade chairs. The plastic seat and back are first quality molded polypropylene. A brilliant feature of plastic folding chairs is the rear leg brace, which is mounted to the bottom of the legs and flush to the ground. This serves to strengthen the chair and keep the legs from sinking into outdoor surfaces. Each chair has been tested to withstand a 250 lb. dynamic (live) load and 750 static weight capacity. * Please call us for any questions on our White Folding Chair Party Rentals and or any of our other party rental equipment in, Poway, Scripps Ranch, Rancho Bernardo, Rancho Penasquitos, Saber Springs, Carmel Mountian Ranch, 4S Ranch, Black Mountian Ranch, Del Mar, Del Mar Heights, Carmel Valley, Torrey Highlands, North City, Fairbanks Ranch, MCAS Miramar, and Greater San Diego & North County.